Anomia (uh-NO-mee-uh) – Noun – Problem with word finding or recall. 2. Chaos. 3. 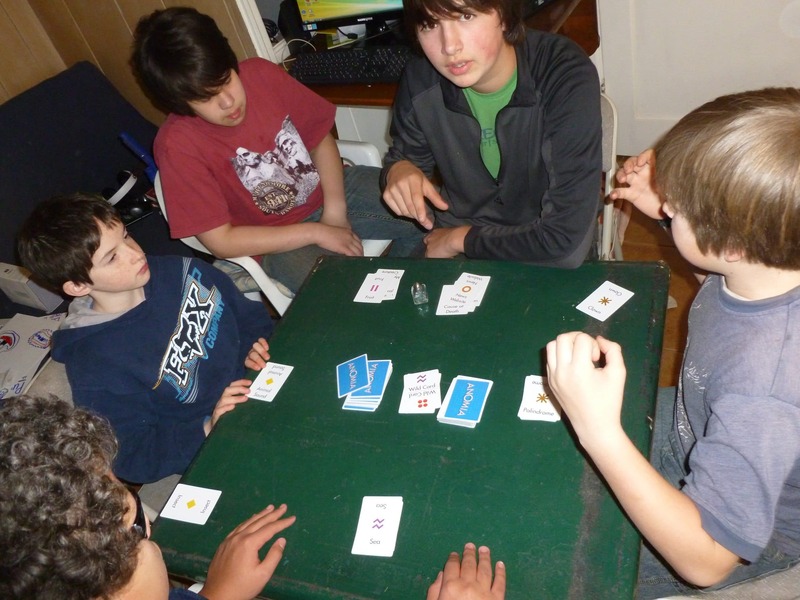 The game where common knowledge becomes uncommonly fun! I was in a Toy Store in Newport, Oregon, looking for Chemistry supplies while the boys played with all of the board games. You could hear them exclaim over games we no longer have, favorites of their friends, and their current champion status at a few. I ended up buying a Magnet set, and at the checkout the lady says, “You seem like a family that enjoys games, I bet I have one that you haven’t tried.” She whisks out a deck of cards and tells me the best way to learn, is to just start playing. In a few moments, we were all hooked! Anomia is for Players: 3-6 players, Ages 10 and up. Goal: To win the most cards by facing-off with other players. Cards: 2 decks. Each deck has 92 unique playing cards and 8 Wild Cards. Duration: One round lasts about 30 minutes. Two rounds are suggested. Vibe: It can be your turn at any time and anyone can be your opponent! The directions are simple. Draw a card from the center pile and flip it over. Does the symbol on your card match one on another player’s card? If so, you must quickly face-off with the other player by giving an example of the person, place, or thing on their card before they can do the same for yours. If you blurt out a correct answer first, you win their card and drawing continues. Sounds simple, right? Wrong! We like the twist of vocabulary and quick thinking. I like hearing the transition of players thinking they can’t – and then being challenged that they Can! It is equally challenging (see definition of Anomia above) for all ages, it sort of levels the playing field. Reading Fruit on your card, and then Sci Fi Movie on the other, You are supposed to blurt out something like Star Wars, but all you can come up with is Banana. Anomia is available at http://www.anomiapress.com/. We’d love it if you peeked at their Facebook Page and “liked” them! Anomia has won several awards, including: the Mensa Select Seal, the American Specialty Toy Retailers’ Association’s Best Toy For Kids 2010, The National Parenting Center Award and the Major Fun Award. 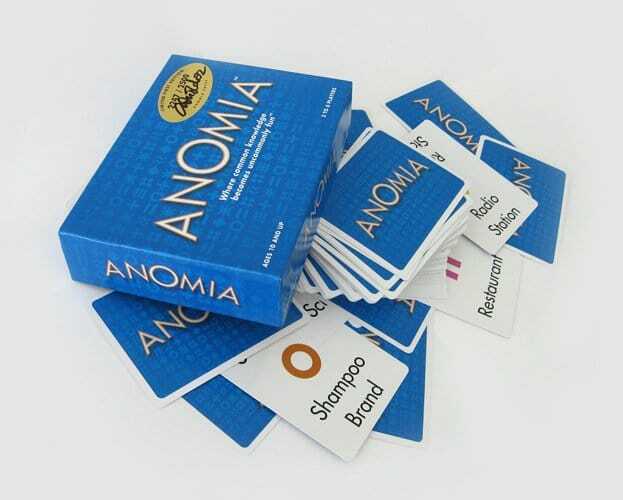 We have played Anomia several times as a family, brought it to our home group time and played with the parents, and have played it with friends when they visit. 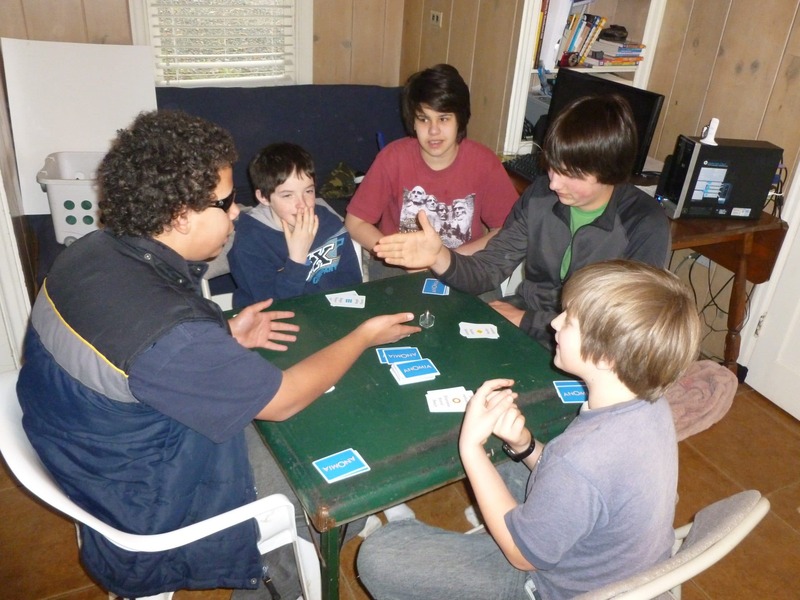 Not one person has been unable to quickly grasp the game, and each player had huge smiles and grins while playing! We are always looking for ways to incorporate language, vocabulary and fun. Anomia fits the bill. You can find Angie and her boys at Petra School creating ways to fill the time between Math and bedtime, usually playing fun games! If you are vacationing on the Oregon Coast and happen upon a gal with a camera around her neck, a pink Letterboxing/Nature Journal backpack on her shoulder, and two handsome boys running along the trail - chances are you've found Petra School on a nature walk. Feel free to join on their adventure as they might be looking for a rare bird, a mushroom, or a good paved path to longboard. Angie is learning to incorporate Charlotte Mason learning into their Notebooking throughout the Middle and High School Learning Years. Looks like a great game. We enjoy games very much and this one seems like it would appeal especially to my oldest son. Would love to win! Thanks. I’m really bad about working games into our days, but my son really loves to play them. I’m trying to schedule family game nights, but it hasn’t become a regular thing quite yet! 🙂 This game looks super fun and would be great to try! I wanted an entry for the sweet game so i can play it, then little jakey and i can play it 😉 hope you and the Family are great! I know you are missed, I always enjoyed your sweet crew!! 🙂 Your such wonderful lovable people!